Mike Kendall sounds like a nice, progressive fellow. He was adopted by an African American family and now his best friend is his brother-in-law. He could almost be a character in a Norman Lear sitcom, if he weren’t such a boozy, self-sabotaging low life. However, he just might earn himself a bit of redemption if he can bring the murderers of a prostitute to justice in Eshom & Ian Nelms’ Small Town Crimes (trailer here), which opens this Friday in New York. Kendall longs to return to the police force, but that just isn’t happening after he helplessly watched his partner get gunned down while in a drunken state. Waking up from his nightly bender on the outskirts of town, Kendall discovers the badly beaten body of a young girl. He racers her to the hospital, but she will not make it. For some reason, Kendall cannot leave things as they are. He starts his own independent investigation, even bluffing the victim’s well-heeled grandfather to retain his services as a private investigator (not that he’s licensed, mind you). Yet, much to the exasperation of the real cops working the case, Kendall starts developing some genuine leads. In fact, he gets close enough to prompt the killers to target his sister Kelly Banks, and her good-natured husband Teddy. Kendall has them convinced he has a legit temp job, which is sort of true, but he is also kidding himself regarding his general crime-fighting fitness. 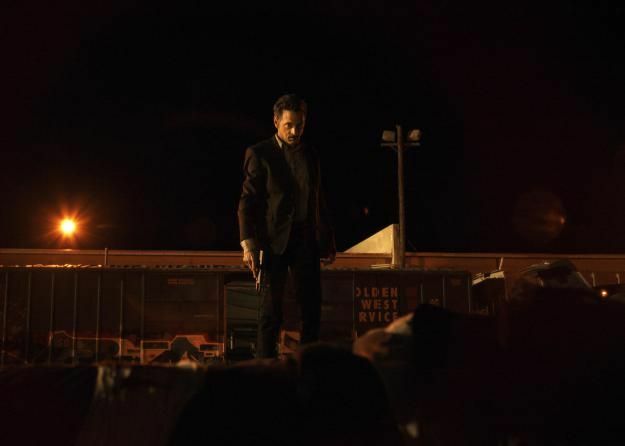 STC is a sly noir in the Jim Thompson tradition, featuring an absolutely terrific performance from John Hawkes. Just when you think he has finally bottomed out, he finds a way to sink even lower. Just looking at his haggard, drawn face gives you the urge to pop an aspirin with some hair-of-the-dog. The Nelms Brothers have a few prior indie films to their credit, but STC deserves to be their breakout. We’d also be happy to see it spawn a bleary-eyed Mike Kendall franchise. He might actually be the most dissolute movie detective since who knows when, but that is all part of his charm. 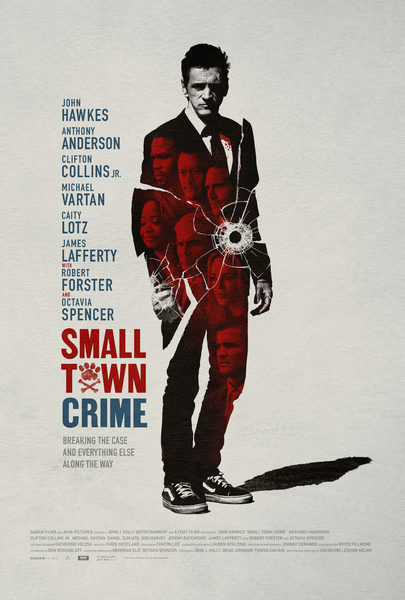 Enthusiastically recommended, Small Town Crime opens this Friday (1/19) in New York, at the Village East.